Hi Kari, how have you already settled in here in Klagenfurt? I have settled in Austria very well. I started working as a watchmaker with Habring Uhrentechnik in Völkermarkt, where I also live. I love it here. My girlfriend from Finland will move here next year as well, so I think we will all settle here very well as a family. Lots of work in the company to be done, and things to learn, so it´s been quite challenging for the first month. But I´m very confident that I will soon get things in order. Klagenfurt is still pretty unfamiliar for me, but first impressions of the city are very good. Especially the lake Wörthersee is very beautiful. Hope I get to see even more of the wonders of Klagenfurt. After a long and successful career you are now dabbling at being a coach. How do you think you can help the team? I will try to bring a lot of winning attitude to the team, and also new tactics and way of thinking about floorball. I value the positive approach in sports all together, and looking forward how the players and staff develop towards being more professional. So I promise that there will be a new KAC-Floorball team, once we hit the playoffs. Naturally my goals are to help the upcoming younger players to achieve their future goals in floorball. That way we will secure the future of KAC-Floorball men´s team for years to come. You are just 35 years old. Wasn’t it too early to finish your career? Haha. I´m very sure of it that it was the best decision for me. I wanted to invest everything that I have towards being the best watchmaker I can be. That´s why I really could not play high level floorball, if I want to succeed in my life goals. And I also suffered a lot of injuries during my career, and I´m recovering as we speak from a hip surgery. So without a doubt I can say that I am happy about my career, but chances of me playing the game of floorball are very slim. In your career you played side by side with international stars. Who impressed you mostly? This is always a hard question to answer. I have to say that there are many players that I have learned from and who have impressed me. But it´s always the long term teammates that stick out the most, so I have to say my dear friend Harri Forsten has been one of the best players I have ever played with. He had it all. The speed, technique, vision and the winning mentality. Also very modest, but confident as an athlete. I have also travelled a long way with him during my career, so he is still an impressive person as a friend and as great example of a human being. You are coming from the country of the world champion to the small floorball-nation Austria. How shocked have you been when you observed the team at it’s training? Not at all. I was actually very impressed about the attitude and how well the team is working together. Of course the skill level and tactics are a bit ancient, but there is no problem once you have the attitude to progress and desire to seek knowledge. Floorball is an upcoming sport here in Austria and even the best leagues have started from some level. We just have to rise that level higher in every training and in every game. And with this team and club I´m very sure that the future is going to be very bright in Austrian floorball. In what way KAC Floorball is different to your former clubs? I have never worn a red shirt in any sport, so that is the first difference. Naturally all of the teams that I have played before were managed more professional and the little things were taken care of much better. But I´m sure that KAC-Floorball will someday achieve that same professionalism. Also my former club were much bigger regarding the amount of players and staff. The club has a great youth program, so that is very similar to the teams that I have played. I am happy to say that´s not a different in any way. You have already had the pleasure to get to know the team a little bit. Which player convinced you mostly until now? I´m not going to say any players who have stood out of their skills, because we have perfect variations of different players with unique skills. There is a lot of scoring power, we are in good physical condition and we are fighters to the end. Franzi has convinced me with he´s personality. Andy as a leader. And we also have a great captain Dominik. What were your first impressions of Head Coach Oliver Pucher? Do you think he is doing a great job? He is a legend in Austrian floorball, so I am honored to work beside him. Nice and funny person, who is a fantastic family man. 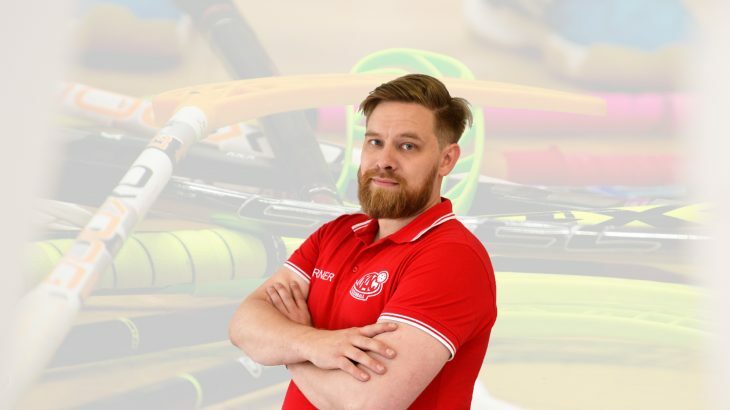 He has done everything he can with the information that he has about floorball, so in that way he is doing a very great job. Of course what I can bring to the team makes us even better as a coaching staff. He is a coach who is willing to develop the team and puts a lot of effort in for the training and games. As my german language is not yet in a good level, he is a priceless asset to me. How far do you think the team can it make this season? I have no other expectations than winning the championship. We have all the tools for a winning team, and I see no other possibility that we need to carry that pressure the whole season. Hope that the audience and fans finds it´s way to the arena in more larger numbers, so they can also be a part of this wonderful season that we are going to have. Also the players perform better once the arena is pumping and loud! Thank you! And I wish all the best to the KAC-Floorball family. See you at the games!